I offer an initial half hour introductory session that I do not charge for. I understand that meeting someone new can be difficult and you might not know what to expect especially if you have not had counselling before. This introductory session is an ideal time for you to ask me any questions that you might have, see if you feel comfortable with the space we are in and with me, and also to go over how we can work together. Maybe think of it as a ‘getting to know you’ session. After this my current session rate is £40 for a one hour session. Sessions will usually be on a weekly basis but this may be negotiated. I do occasionally offer reduced rates to counsellors in training, or those experiencing financial hardship. Please ask for further details. 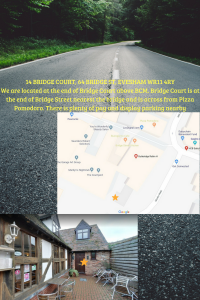 Location: Sessions will take place in the Evesham town centre at 14 Bridge Court, 64 Bridge Street. My appointment times vary but generally I can do the below. Although if these times do not suit you, please contact me to discuss. Cancellations: If you need to cancel for any reason there will be no charge unless there is less than 24 hours notice, in which case there will be a cancellation fee of 50% of the regular full session fee. I understand that sometimes unexpected things occur so please do talk to me about this if you have any concerns. Holidays and breaks: I tend not to work on Bank Holidays and take my main holiday over the summer. I will give you several weeks notice beforehand when I will not be available and ask that you please do the same. Payments: I currently accept cash (receipt will be provided) on the day and BACS transfer. Paypal can be arranged if necessary. I do not currently accept card payments due to the number of cash machines nearby.